Hi everyone, Katie here, reporting LIVE from the townhouse. The blogosphere is a-buzz with news of the 2012 Petties Awards for Excellence in Pet Blogging. The coveted Pettie is like the Oscar (not Mayer) of Pet Blogging and Social Media. This little cat from Minneapolis and her girl actually scored a nomination! And now do we EVER need your help! We need votes. And LOTS of them. We're playing with the big cats now. Cats that have like 5,039,894,802,938 friends. Glogirly's no help at all. She has maybe 3. Only one even knows she has a cat. GLOGIRLY Nominated For Best Blog Post: "Framed"
Remember a few weeks ago when I was wrongfully accused of Shoelace Tampering? That's the BLOG POST we're nominated for! Justice, I tell you...JUSTICE! I just KNEW my story would be heard. - You can vote once a day, everyday, through July 31. - The easiest way to remember is to add a *Glogirly-Reminder* on your computer, calendar, phone or email. 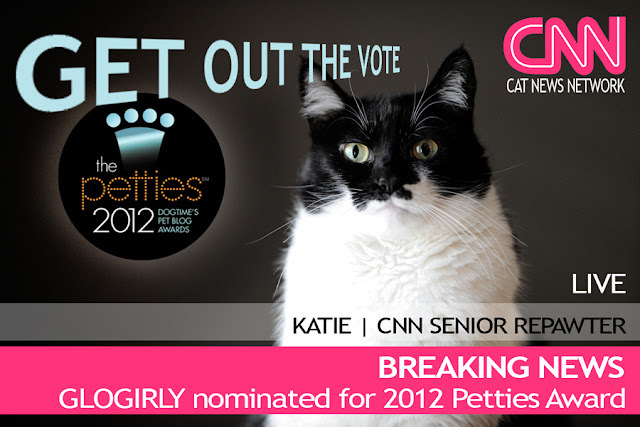 - Click the 2012 Petties Award Voting Link and choose one blog from each of the 10 categories. - We've got lots of friends nominated too...so be sure to share the love! and a vote for Katie is a vote for the little cat! CONGA RATS!!!!! This is so exciting! We stopped by and voted. Good luck! MOL @ Patty (and Pricilla), 'cause I pretty much did the same thing! I think you totally should have had a shot at best video! I really hate that we are competing against each other in the Best Blog Post category - actually EVERYONE'S posts in that category are amazing! Good luck, but really, I think we are all already winners! Congratualtions! and I agree with Sparkle - all of the nominees are already winners. That was a great blog post, and we will sure support you with votes. We also loved your Housecats videos. There should be a new category for video awards for creative ones like that. Congratulations on your nomination, and good luck! That is so great Katie. We sure will vote for ya. i hope your acceptance speech isn't one of those "i was just happy to be nominated" speeches. you go for the gold girl. I wish we could get one vote for each of us kitties and woofie. Concats...off to vote now! purring for you to win big! Congrats, Katie! Good luck! We'll be voting!! I voted for ya Katie! I am also a finalist for the Best Cause-Related Blog. I am SOOOO excited! We voted for you yesterday. Now to be completely fair, we will have to vote for Sparkle every other day, but still, you have my every other vote! 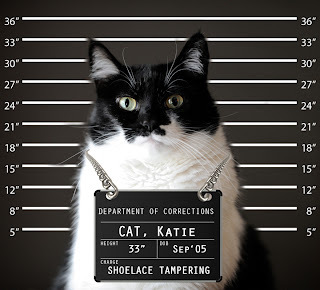 Congratulations on the nomination, Katie, this is great! Paws crossed for you! Go Katie Go! I went and voted. Yea! My whiskers sure did grin up when I saw you on the finalist list, congrats!!! Big Congrats on your nomination buddy - You're gonna Rock it!! We went there to vote for you! LOL. Congratulations on your nomination! We LOVED that post! YOU deserve this and we hope you win. We're gonna go right now and vote. Congratulations, Katie, and good luck! I was shocked and surprised to find that I was nominated for one of those Petties, too! Woohoo! 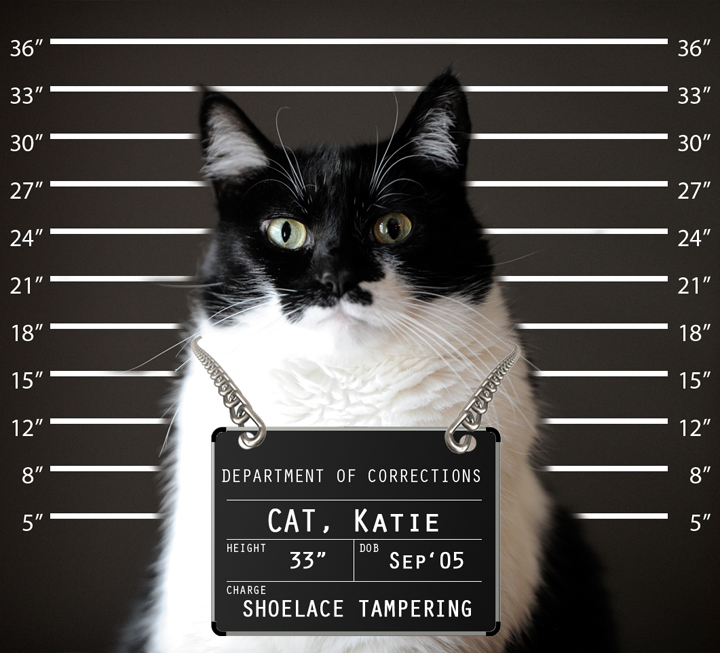 Allie: Katie, it's about time CNN came to their senses and had more FAB and Fascinating Correspondents! Concatulations Katie! We wish you good luck! That is a great post!